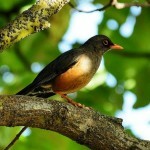 April 16, 2012, Addis Ababa, Ethiopia–Awoke in Addis to the sound of birdsong, soon accompanied by the distant sound of dogs barking to one another, a donkey braying and then the dawn calls to prayer. Who needs an alarm clock when you have all of this! A wonderful way to wake up after 20-plus hours of travel from Toronto, Canada to Addis Ababa, Ethiopia. 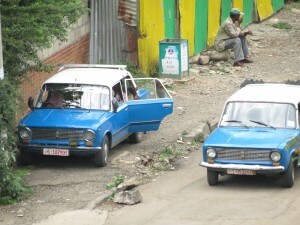 The roar of antiquated Ladas in the street below finally got me up out of bed. Excited to be here to visit CFTC’s Ethiopian partners – meet their teams, see CFTC-funded projects in action, and speak with the children and communities CFTC is supporting in Ethiopia. Ethiopia is a fascinating country. The largest landlocked country in Africa is one of the oldest sites of human existence, with a long history of power and independence. Today, Ethiopia is the top coffee and honey-producing country in Africa, with the largest livestock population in Africa. Ethiopia ranks 11th in the world for improving human development since 1970 – the decade when it was hit with massive famine that eventually toppled the Imperial government. Over recent decades, it has seen primary school enrolments quadruple, child mortality almost cut in half, access to clean water more than double and is currently one of only four African countries set to achieve six out of eight Millennium Development Goals by 2015. 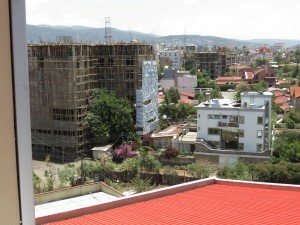 Buildings under construction in Addis, Apr 2012. Foreign investment appears to be pouring in for infrastructure and manufacturing and more, and you can see the evidence in Addis of many new buildings being constructed. However, Ethiopia is still one of the poorest countries in the world, ranking 174 out of 187 countries on the 2011 Human Development Index. With the second largest population in Africa (85 million), 90% are classified as the ‘multi-dimensionally poor’ with 30% — i.e., those living in extreme poverty on less than $1.25 a day. 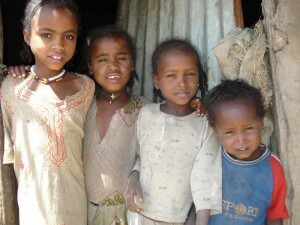 Children like these continue to experience "multi-dimensional poverty" - living on less than $1.25/day. Malnutrition and preventable diseases kills over 500,000 children per year and there are high levels of food insecurity despite the fact that the country has a long history and culture of agriculture. While the government has been making investments in food security, health and education, there is still a long way to go as it takes time for these investments to deliver social returns. The global economic downturn further exacerbates the existing poverty levels. I had an interesting conversation with a young man working at the small hotel we are staying at who told me about the impact of the double-digit inflation the country is experiencing – and how the result of doubled and tripled prices is impacting him as his salary stays the same: A t-shirt that used to cost 17 birr ($1) is now costing three times that, and the same is happening to his food and rent. He is having to work multiple jobs just to be able to eat and to put a roof over his head. Tomorrow, I will meet our Ethiopian partners at a two-day forum before we join them for project visits. I have read the proposals and reports prepared by the staff of MCDP, EDA, CHAD-ET and ISAPSO – but now I get experience them first hand. Can’t wait! Stay tuned for more posts, and until then, take care….